I hate everything about time. Being on time, looking at time, adhering to time. EVERYTHING. My hate for time is a big reason why I never wear watches because then, I would be handcuffed by time. AND WHO WANTS THAT. I'm a free spirit! Don't change me world! 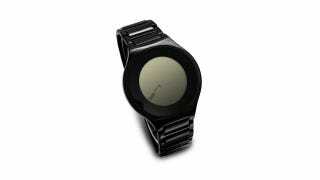 Or I can just wear this Kisai On Air Watch that looks more like a faceless watch than a timecuff. First, the gadgetry. The Kisai On Air has a colored LCD touchscreen display with LED backlight and can be programmed with time, date and alarm all via touch. Hell, you even 'unlock' the watch with a iPhone-esque left to right swipe. The Kisai On Air slickly shows time by displaying the minutes on the hour hand, so if it says 45 and points toward 3 o'clock, it's 3:45. 18 pointing at 6? 6:18. Simple! If you're a time lover, you can still very easily get the gist of the story and not run late. But time loving I do not and running late I do not care. I like the Kisai On Air because it reminds me of faceless watches and this beautiful Infinity piece by Levi Maestro and Shayan Afshar (spoiler, it's a watch shaped bracelet without the watch), both "watches" I've always wanted to buy but could never justify spending cash on because it's a little hipster silly ironic and also irresponsibly expensive. Sure I don't care for time but that doesn't mean I toss aside logic!